One of the most widely known side-effects of antibiotics use is antibiotics-associated diarrhoea (AAD). Although usually temporary, AAD can have a major impact on the quality of life, especially in elderly people, children and people with a chronic illness. AAD is the result of a disruption in the microbiota caused by antibiotics. Healthcare expenses, morbidity and mortality can potentially be significantly lowered by reducing the incidence of ADD and CDAD (Clostridium difficile-associated diarrhoea) using probiotics. In addition, it will lead to a significant increase in the patient’s quality of life. Antibiotics are indispensable in our fight against infectious diseases. In the Netherlands, 3.5 million people are prescribed antibiotics each year.1 For each 1,000 citizens, that amounts to just under eleven daily doses. Compared to the rest of Europe this is low. In Belgium and France, the figure is almost 2.5 times higher, and in Greece the number of daily doses per 1,000 citizens is no less than 32. However, the use of antibiotics is linked to side effects. One of the most widely known side-effects of antibiotics use is antibiotics-associated diarrhoea (AAD). Although usually temporary, AAD can nevertheless have a major impact on the quality of life, especially in elderly people, children and people with a chronic illness. AAD is the result of a disruption in the microbiota caused by antibiotics. Although antibiotics are given to eliminate specific pathogens, they also have a major impact on the bacteria making up the microbiota. It is important to realize that even without symptoms of diarrhoea , the microbiota will still be affected by antibiotics. Numerous studies have shown that the use of antibiotics will lead to a decrease in the diversity of the microbiota.2 3 While the microbiota will recover, the original composition and diversity will not be fully restored. Antibiotics use can lead to long-term disruptions in certain microbiota subpopulations,4 5 6 and it is thought that some bacterial groups do not return at all. Another aspect is that the effect of antibiotics is not limited to bacteria sensitive to the antibiotic in question. Other bacteria that exchange secondary metabolites and waste products with the antibiotics-sensitive bacteria will also be affected. The microbiota plays a key role in maintaining good health, for instance by breaking down indigestible carbohydrates, synthesizing vitamins (B and K) and by offering protection against pathogenic micro-organisms, including Salmonella typhimurium, Candida and Clostridium difficile. 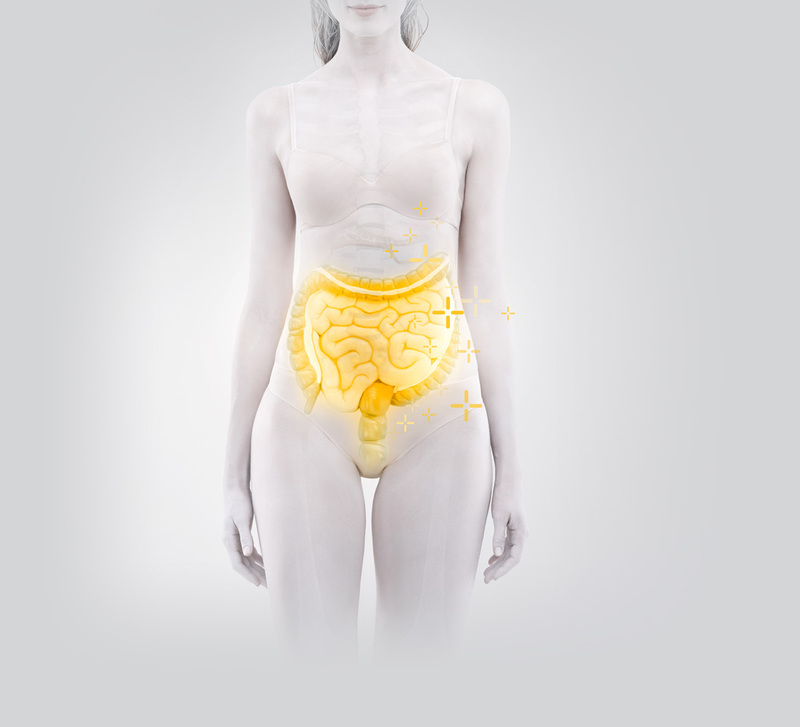 Apart from that, the microbiota influences the barrier function of the gut as well as a balanced development of the immune system and the maintenance of immune homeostasis. This is because our immune system needs to learn which bacteria (pathogens) it needs to act against and which ones it needs to ignore (commensal bacteria), i.e. develop immune tolerance to. Changes in the composition and diversity of the microbiota caused by antibiotics disrupt these processes, increasing the user’s susceptibility to disease. Commonly known examples are Clostridium difficile overgrowth, which can lead to pseudomembranous colitis, a very severe bowel infection that can be life-threatening. More and more clues are being found that link the use of antibiotics to all kinds of health conditions, including inflammatory bowel diseases, obesity, irritable bowel syndrome (IBS) and allergies.5 7 8 9 10 Spanish researchers, for instance, showed that long-term use of antibiotics can lead to weight gain due to changes in the microbiota,11 while another study showed that babies given antibiotics in the first 5 months of life are at a greater risk of obesity.12 In yet another study, children given 7 or more courses of antibiotics before the age of 18 were shown to be at triple the risk of inflammatory bowel diseases, such as ulcerative colitis (UC) and Crohn’s disease. The colonization of our gut by bacteria and the associated programming of the immune system start at birth. In this earliest stage of life, the specificity and memory of both the innate and the adaptive immune system are created and the foundation for the immune system’s functioning is laid. Disruption of the microbiota therefore seems to have the most adverse impact in young children. This makes it all the more noteworthy that most antibiotics are prescribed to children. A growing number of studies shows that the use of antibiotics has negative long-term health effects due to its disruptive impact on the microbiota. Restoring or strengthening our commensal microbiota in order to minimize this impact is not easy, but the use of faecal microbiota transplants (FMT) and administering probiotics have led to promising results. Faecal transplants, for instance, in which a patient receives a healthy donor’s stool through a gastric tube, has proved highly effective in treating recurring C. difficile infections (CDI). A clinical study conducted a number of years ago showed this to be so successful that the study was terminated prematurely because researchers considered it unethical to withhold treatment from the control group. The cure rate was 81% (and even 94% after a second transplant), compared to a quarter in those receiving standard antibiotics therapy.13 Since then, other groups in other parts of the world have produced similar results. A disadvantage of FMT is that it is not devoid of risk. Although donors are screened as rigorously as blood donors, there is no guarantee that no (unknown) viruses are transmitted. Because screening a donor is labour-intensive, FMT is fairly expensive. Although FMT has now been incorporated in the guidelines for recurring CDI, it is not standard practice to apply FMT after a course of strong antibiotics, and its price tag will not help to change this. However, when no severe (life-threatening) complications are expected and the potential consequences (such as PDS, allergy, etc.) are not likely to occur in the near future, patients are highly likely to reject a procedure like FMT that many people will feel instinctively repulsed by. The effect of probiotics for AAD prophylaxis in adults and elderly patients was recently described in a meta‑analysis conducted by Jafarnejad et al . A total of 30 studies comprising 7,260 children were included in the analysis. For adults, a clearly positive effect was seen for the use of probiotics in AAD prophylaxis (25 RCTs, 3,826 adults; RR, 0.47 [95% CI: 0.4–0.56], P< .00001). This was not found in elderly patients (5 RCTs, 3,434 elderly; RR, 0.94 [95% CI: 0.76–1.15], P= 0.54).15 The authors added the proviso that, concerning elderly patients, no conclusions could be drawn as to the effectiveness of probiotics. Reasons for this include the small number of studies (n=5) but also the small sample size of most studies compared to one very large study (n=2,941), which showed no effect. There is also convincing evidence for the effectiveness of probiotics in CDAD prophylaxis. In a systematic review and meta-analysis with 26 RCTs and 7,957 patients, Lau at al. showed that probiotics can reduce the risk of CDAD by almost 60% (RR, 0.395 [95% CI: 0.294-0.531], P<0.001). Probiotics proved effective in both adults and children (59.5% and 65.9% reduction)16. Healthcare expenses, morbidity and mortality can potentially be lowered significantly by reducing the incidence of ADD and CDAD (Clostridium difficile-associated diarrhoea) using probiotics. In addition, it will lead to a significant increase in the patient’s quality of life. Furthermore, there is a (relatively small) number of studies that showed probiotics can reduce/reverse antibiotics-induced microbiota imbalances.17 18 19 Restoring the microbiota by prescribing probiotics after antibiotics use is thought to be a promising therapeutic option, especially in children, to reduce the risk of conditions associated with microbiota imbalance, including obesity, allergy and IBS. To combat the side effects of antibiotics, Winclove Probiotics developed and clinically tested the Ecologic® AAD formula in partnership with the Maastricht University Medical Centre (MUMC). In the context of this study, the bacteria in Ecologic® AAD were selected specifically to reduce and reverse the antibiotics-induced microbiota imbalance. Apart from that, the strains were selected for their in vitro potency to inhibit the growth of Clostridium spp. and Clostridium difficile, and to reduce the production of Clostridium difficile toxins. The research formulation Ecologic® AAD is not sold as a consumer product. However our worldwide business partners offer the formulation Ecologic® AAD as their own branded product. Thus the specific bacterial composition can be found in different products around the world. 1. Report by the Organization for Economic Cooperation and Development (OECD). 2. Greenwood C, et al. Early empiric antibiotic use in preterm infants is associated with lower bacterial diversity and higher relative abundance of enterobacter. J Pediatr. 2014;165:23-9. 3. Vrieze A. et al. Impact of oral vancomycin on gut microbiota, bile acid metabolism, and insulin sensitivity. J Hepatol. 2014 Apr;60(4):824-31. 4. O’Sullivan O, et al. Alterations in intestinal microbiota of elderly Irish subjects post-antibiotic therapy. J Antimicrob Chemother. 2013 Jan;68(1):214-21. 5. a. b. Ianiro G et al. Antibiotics as deep modulators of gut microbiota: between good and evil. Gut 2016;65:1906-1915. 6. Jernberg C, et al. Long-term ecological impacts of antibiotic administration on the human intestinal microbiota. ISME J. 2007 May;1(1):56-66. 7. Blaser M. Antibiotic overuse: Stop the killing of beneficial bacteria. Nature 2011;476:393-94. 8. Dethlefsen L, Eckburg PB, Bik EM, et al. Assembly of the human intestinal microbiota. Trends Ecol Evol 2006;21:517-523. 9. Othman M, Aguero R, and Lin HC. Alterations in intestinal microbial flora and human disease. Curr Opin Gastroenterol 2008;24:11-16. 10. Penders J, Stobberingh EE, van den Brandt PA, et al. The role of the intestinal microbiota in the development of atopic disorders. Allergy 2007; 62:1223-1236. 11. Hernández E et al. Functional consequences of microbial shifts in the human gastrointestinal tract linked to antibiotic treatment and obesity. Gut Microbes. 2013;4(4):306-315. 12. Trasande L et al. Infant antibiotic exposures and early-life body mass. Int J obesity 2013;37(1):16-23. 13. Van Nood E, et al. Duodenal infusion of donor feces for recurrent Clostridium difficile. N Engl J Med. 2013 Jan 31;368(5):407-15. 14. Goldenberg JZ, et al. Probiotics for the prevention of pediatric antibiotic-associated diarrhea. Cochrane Database Syst Rev. 2015 Dec 22;(12):CD004827. 15. Jafarnejad S et al. Probiotics Reduce the Risk of Antibiotic-Associated Diarrhea in Adults (18-64 Years) but Not the Elderly (>65 Years): A Meta-Analysis. Nutr Clin Pract. 2016 Aug;31(4):502-13. 16. Lau CS, Chamberlain RS. Probiotics are effective at preventing Clostridium difficile-associated diarrhea: a systematic review and meta-analysis. Int J Gen Med. 2016 Feb 22;9:27-37. 17. Engelbrektson A, Korzenik JR, Pittler A, Sanders ME, Klaenhammer TR, Leyer G, et al. Probiotics to minimize the disruption of faecal microbiota in healthy subjects undergoing antibiotic therapy. J Med Microbiol. 2009;58:663-70. 18. Rehman A, Heinsen FA, Koenen ME, Venema K, Knecht H, Hellmig S, et al. Effects of probiotics and antibiotics on the intestinal homeostasis in a computer controlled model of the large intestine. BMC Microbiol. 2012;12:47. 19. a. b. Koning CJM, Jonkers DMAE, Stobberingh EE, et al. (2005) Effect of a multispecies probiotic on the composition of the dominant faecal flora in healthy volunteers. Gut 54(Suppl VII), A243. 20. Koning CJM, Jonkers DMAE, Stobberingh EE, et al. (2005) Effect of a multispecies probiotic on the composition of the dominant faecal flora in healthy volunteers. Gut 54(Suppl VII), A243. 22. Internal report Institut Allergosan. 23. Hell M, et al. Probiotics in Clostridium difficile infection: reviewing the need for a multistrain probiotic. Benef Microbes. 2013;4(1):39-51.